Daily Slideshow: One of the greatest entertainers of all time was a motorcycle man through and through. Jean-Philippe Smet's (also known as Johnny Hallyday) Harley-Davidson trike went up for auction in February of this year and sold for a staggering $69,663. Hallyday's trike, which he himself sold in 2016, was auctioned during Rétromobile show week. The auction price is hardly surprising, considering the flamboyant Hallyday was credited with bringing Rock and Roll to France. Hallyday, who passed away in December 2017 from lung cancer, was known as the 'French Elvis' when he started performing in 1959. 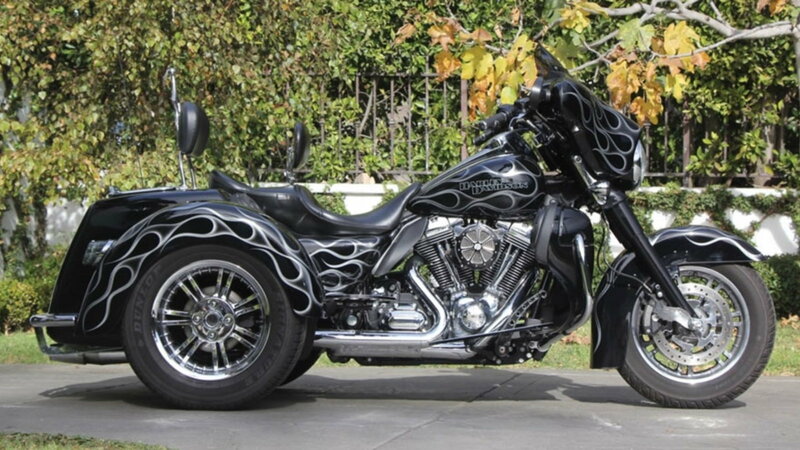 The trike in question is a 2010 Harley-Davidson FLHXXX Street Glide custom trike. The bidding range for the trike, which as less than 6,000 miles on the odometer, was set between $74,500-$105,000, but had no reserve. The trike echoed Hallyday's flamboyant personality with its Buckwild flamed paint job. Hallyday was known for having customized motorcycles so, of course, this trike had some extra work done to it. Apart from the paint job, other custom touches include Thunderheaders and Battistinis shifters. The trike was auctioned by RM Sotheby's at Place Vauban. 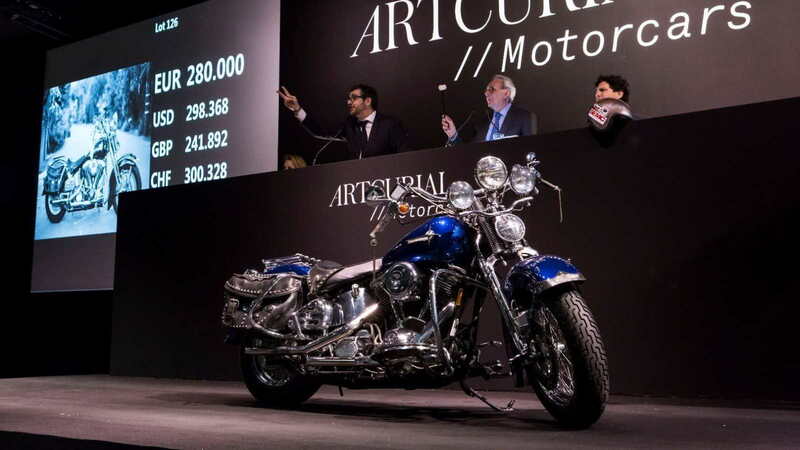 RM Sotheby's put the trike up for auction during Rétromobile week, and it wasn't the first time one of Hallyday's Harleys was auctioned off during Rétromobile week. 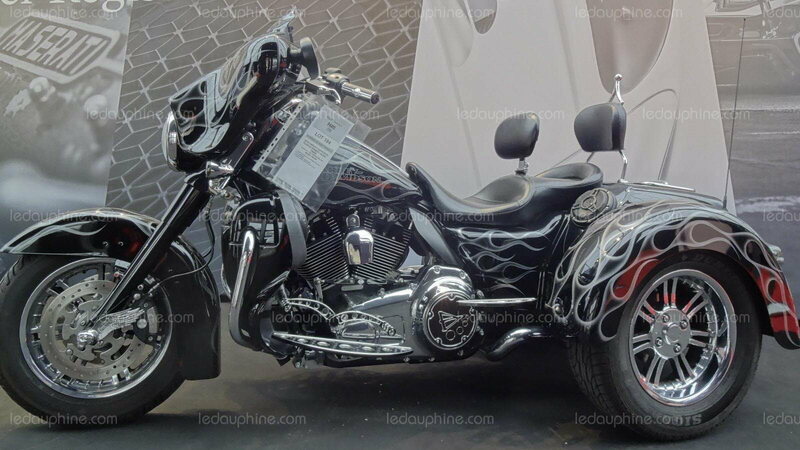 >>Join the conversation about Johnny Hallyday's trike right here at HDForums! As mentioned before, Hallyday had auctioned off Harley-Davidsons before. In 2017, Hallyday auctioned off his 1989 Harley-Davidson Softail Springer for a world record-breaking $298,193. 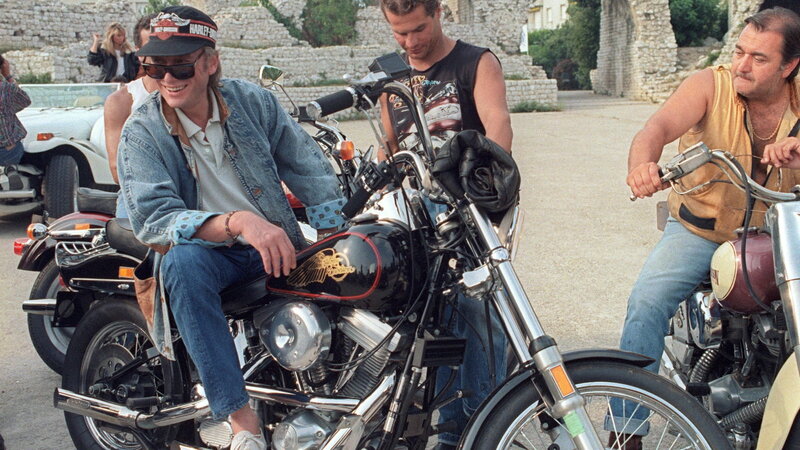 Hallyday had the Springer delivered to Paris in 1989 before getting American Moto to customize it. After this, it was shipped to his villa in Saint-Tropez before finally being shipped to Los Angeles. Although this bike was just one out of hundreds in Hallyday's collection, it was one of his favorites. He managed to clock up 11,750 miles on it, which is impressive when you consider just how many motorcycles and cars Hallyday owned. Realistically, Johnny Hallyday isn't a name that everyone will know but it's undeniable that he is one of the greatest entertainers of all time. Hallyday's career spanned over 60 years, during which time he recorded over 1,000 songs, sold 18 platinum albums and over 110 million records, completed 181 tours, as well as appearing in 16 movies. Yes, Hallyday was an entertainer through and through and continued performing right up until he passed away. While many entertainers have a passion for cars, Hallyday was a true motorcyclist at heart, something which is evident from the countless pictures taken of him riding bikes throughout his career. Hallyday is, undoubtedly, one of the greatest entertainers who was also a true motorcyclist. While the name Johnny Hallyday mightn't be a household name across the globe, it certainly is in France. Hallyday passed away on December 6th aged 74 and, when his funeral took place on December 9th, the streets were lined with nearly one million mourners and nearly 1,000 motorcyclists were part of his funeral procession. Speaking about Hallyday, French President Emmanuel Macron said Hallyday "transcended generations and is etched in the memory of the French people". This writer wishes the best of luck to the new owners of Hallyday's trike.